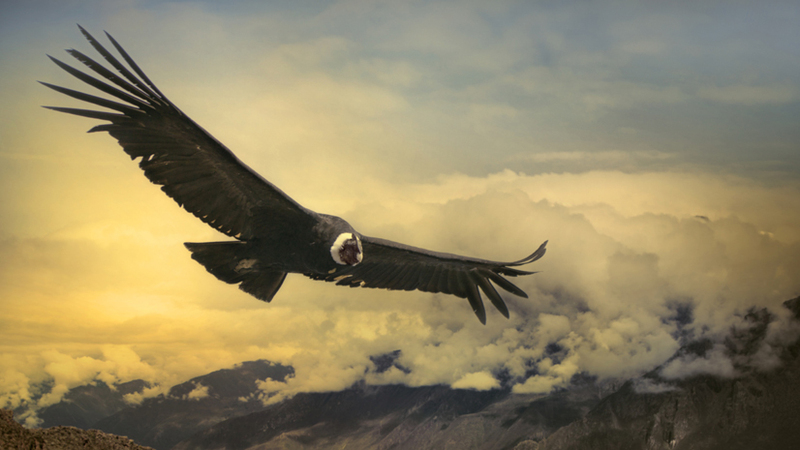 Follow a scavenging Andean condor as it soars over the Andes in search of food. The Andean condor is one of the largest flying birds in the world, with a wingspan of up to 3 metres. Winds in the Andes reach up to 160 kilometres per hour, allowing condors to glide long distances without using any energy. Andean condors are scavengers, and can spot carrion from many kilometres away. Condors use their large size to scare away other scavengers such as foxes. High in the Andes mountains, over 5000 metres above sea level, an Andean condor scours the landscape for food. These vultures are among the largest flying birds in the world. Males can weigh up to 15 kilograms, yet their broad wingspan allows them to soar effortlessly.